Gamers and Geeks of all ages! Join Andy and his Detroit based crew for rousing games and quests that are sure to entertain the geekiest of minds. 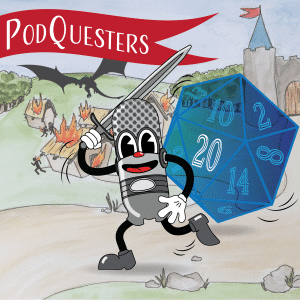 Podquesters is a comedic improv show based on the role-playing style of wildly popular games like Dungeons and Dragons. Four players assume characters while another player controls the world these characters inhabit. The four main players make the decisions in the story, and the Dungeon Master controls the overall events and story arc. Surprise Guests! Local and national comedians have guest spots strategically placed in independent segments by the Dungeon Master. class="page-template-default page page-id-10148 page-child parent-pageid-570 samba_theme samba_left_nav samba_left_align samba_responsive wpb-js-composer js-comp-ver-5.7 vc_responsive"